Pulled an all nighter in work - had a big install. Got home at 8am and hit the hay. Woke up to the sound of freakin' lawnmowers at 1pm (can't really complain since mowing lawns indicates nice weather). 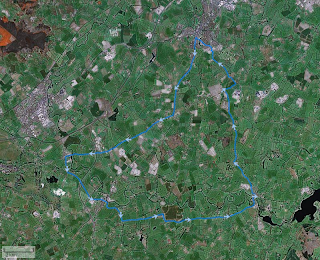 Got up and went on a fast, flat 37km spin around Naas, Kilcullen, Ballymore Eustace etc on the Giant. 25% of the spin with at 90%+ MAX HR so felt good after it. That'll probably be my last spin till the race. On top of just resting up I have also picked up strain (or something) deep in my right calf. I think it happened on the interval stuff on Sunday. Its fine to walk on and cycle at a steady pace, but stretching it or pushing the pedals and its quite noticeable. So will do some more stretches and maybe wrap it up for a couple of days. Its the middle of July and I've only notched up 100km! Its mainly down to being sick, but the weather is reducing my cycling opportunities. Plus the race this weekend will mean nothing for the rest of this week. But after that I have almost 2 weeks left in the month to start putting in lots of km's in preparation for the marathon champs starting in the middle of August, and the Kildare 100 in early August. Sandwiched in between is the final NPS in Moneyscalp also. I'm guessing that July's total km's may only reach 500/600 kms.